It’s Monday! And you know what that means – it’s time for my weekly weigh in! Now, I’ve gotten a few comments/criticisms about this Shape Up series on how short term diets are not the key to long term weight loss. Therefore, I feel the need to re-address the purpose of these posts: First, the 10 lbs I gain over the holidays is something that happens almost every year (bad on my part, but pretty much unavoidable with all the delicious homemade food at home), so this Shape Up is what I do EVERY WINTER so I can get back to 130lbs, the weight I keep during other ~300 days of the year. I've been 130lbs for about 5 years now and it’s the weight I feel most comfortable at (where I can eat healthy most of the time, but still indulge once in a while). Furthermore, even after I lose my 10lbs, I still plan to use/eat all the tips, recipes, and food options I've posted -- and I encourage you to do the same! This is what 130 lbs looks like! With that off my back, let's get on to the recap of last week! Day 3: 45 minutes on the treadmill, speed 3.5, incline 2.0 – Check! Day 4: 30 minutes on the recumbent bicycle, level 7; 30 minutes ExerciseTV’s Cardiokie with Billy Blanks Jr.; 30 minutes weight training using 5lb to 8lb weight – It was a snowy slushy cold mess outside, and I didn’t want to slip and break a hip to go to the gym. Thank God for ExerciseTV from On Demand and my hand weights at home. Plus I got to change my routine up a bit…Check! Day 5: 30 minutes on the elipitcal trainer, level 5; 10 minutes on the recumbent bicycle, level 7 – Check! Day 6 &7: Rest – An Easy Check! 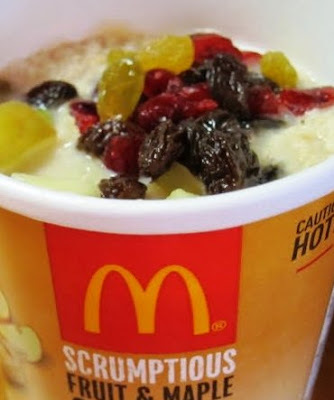 A few weeks ago, I was contacted by the McDonald's team to taste test their new Fruit and Maple Oatmeal from the breakfast menu. Since I’ve had high cholesterol pretty much my entire life (d*mn genetics! ), I try to eat oatmeal regularly for breakfast, due to its magical cholesterol reducing abilities and ease of preparation. Frankly, I was highly skeptical that McDonald's oatmeal would be palatable, but given that their recent healthier menu items (fruit smoothies, salads, yogurt parfaits, etc) have been actually tasty, I decided to give it chance on one frightfully chilly Boston morning. WOW! Color me shocked because this $1.99 bowl of heart attack prevention tasted much better than my usual Instant Quaker Oats. The generous portion of fresh sliced apples, raisins, and dried cranberries really gave the oatmeal a nice flavor profile and meshed well with the hint of maple flavor. But the best thing? This bowl only contains 290 calories and kept me full and satisfied until lunch (full nutrition profile here)! Congrats Frank (Grand Prize) and Lara @ GoodCookDoris (1st Prize)! I totally applaud McDonald's push for healthier menu items (that still taste good), so I am offering a $25 gift card (I don't mind if you spend it on fries and a Big Mac, but I totally recommend you try the oatmeal/smoothies/healthy menu items!) and 2 coupons to try their new Fruit and Maple Oatmeal for two financefoodie.com readers. 1. REQUIRED: In my comments section, tell me what is your favorite oatmeal topping? (Mine is fresh strawberries - maybe McDonald's can add that in their oatmeal too (Hint Hint)!). Also please include your email address so I can contact you if you win! Contest ends Wednesday, January 26, 2011 at 5pm EST. Winners will be chosen via random integer generator on random.org announced on the financefoodie.com site shortly afterwards that night! Disclosure: McDonald's provided me with the free product coupons to try the product and for the giveaway. I bought the Arch Card myself. My favorite oatmeal topping by far is walnuts and pumpkin butter. Even when its not fall! My favorite oatmeal topping is fried apples with cinnamon and toasted pecans. Blueberries is my favorite oatmeal topping. My favorite oatmeal topping is raisins. I like brown sugar on my oatmeal. My favorite oatmeal topping is blueberries and brown sugar! I enjoy apples but if possible with a little cinnamon. I usually have Quaker old-fashion oatmeal every morning and I top it with dried cranberries and lots of cinnamon...Delicious! I'm following on Twitter @jazzchild32. My favorite oatmeal topping is brown sugar! I love to add maple syrup! And sometimes a swirl of almond butter or peanut butter. I love to put fresh cherries on top of the oatmeal. Nuts like chopped almonds or walnuts taste good too. Bananas is great topping on oatmeal. I like to put slices of peaches on top of my oatmeal! Okay, this probably isn't a "healthy diet solution", but I love milk chocolate chips on my oatmeal! I love oatmeal with raisins and brown sugar. I like bananas, but in it, not on it. I like maple syrup and cinnamon on mine. My favorite oatmeal topping is brown sugar and cinnamon...probably not the healthiest but I love it! My favorite oatmeal topping is dried tart cherries, with walnuts sprinkled on top. Brown sugar is my fav! My favorite oatmeal toppings are peanut butter or maple syrup. I like banana topping on my oatmeal. My favorite topping is brown sugar! My favorite oatmeal topping is nuts and berries. Irish butter is the best topping for me. My favorite oatmeal topping is brown sugar. My favorite is cinnamon and sliced peaches. I like blueberries and stevia. My favorite oatmeal topping is sliced banana, sprinkled cinnamon and a drizzle of honey. Yum! I love just a bit of cinnamon and a few raisins. My perfect bowl of oatmeal contains raisins, a sprinkling of cinnamon and swirls of honey. My favorite topping is cinnamon and apples. my favorite oatmeal topping is margarine and a little low-cal sugar. Love it! twitter follower of FF as sherri2345. retweeted yhttp://twitter.com/#!/financefoodie1our tweet here: as sherri2345. I like honey in mine. I like to chop up dried fruit - apricots, raisins, cranberries, etc. and add milk and a little brown sugar. I like to chop up dried fruit - apricots, cranberries, raisins, etc. and add milk and brown sugar. Definitely strawberries. I'm wicked psyched to see that they offer one of my favorite breakfasts. I like rspberries as topping. My favorite topping is raisins. i really like maple syrup,peaches and cinnamon! My favorite oatmeal topping is pecans, if I have them. But always brown sugar and milk. i follow u on twitter already! I love dried cherries and cinnamon. Cut up bananas are my fav topping! My favorite topping is brown sugar. I love either strawberries or blueberries, thanks! I like blueberries on oatmeal. My favorite oatmeal topping is cinnamon, brown sugar and chopped pecans. I love butter and brown sugar and raisins with my oatmeal. I like cinnamon and brown sugar on my oatmeal. speaking of banana... your post made me hungry so i think i am going to grab one. yum! My favorite is just milk with sprinkle of Splenda. But did you know the maple flavoring at Mac Donalds is made from the bark of a bush and doesn't come from any real maple syrup? Raisins, brown sugar and cinnamon. Blueberries are my fave topping. My favorite topping is brown sugar and pecans. I like to top mine with blackberries. I love peaches and cream, yum! My favorite oatmeal toppings are cinnamon and brown sugar. Sometimes a few sliced banana pieces, but usually just milk. My grandma lived to be 95 and she ate oatmeal every morning for breakfast. So it's definitely a healthy food choice! (or maybe she just had good genes!) Perhaps a little of both. I get to be #100 -- My favorite topping is honey and some nuts. I can't have fruit darn it. My favorite oatmeal topping is cinnamon and a tiny bit of brown sugar. Kinda wierd but mine is walnuts and chocolate chips. I love brown sugar on my oatmeal. I like almonds and dried cranberries. My favorite is a little milk, and some brown sugar! YUM! thanks for hosting! Apples and Cinnamon! Love that on Oatmeal! My favorite is cinnamon and brown sugar. I like slices of banana on mine oatmeal. I like a little cinnamon! Brown Sugar is my favorite topping! My favorite oatmeal topping is fresh blueberries and lots of cinnamon! I like apples and raisins! I love to add peanut butter. My current favorite oatmeal topping is homedried raisins, home canned spiced apple slices (think apple pie), flax seed and (bad) a splash of flavored creamer (think pumpkin pie spice, or french vanilla) and non fat milk. I always add cinnamon and raisins to my oatmeal. You are looking great btw, keep it up, I know you'll make it. I love raisins. They add just the right touch of sweetness. My favorite oatmeal topping is crushed walnuts. I love brown sugar on mine! I like a small amount of brown sugar! I like to stir a bit of peanut butter in my oatmeal. I like sliced bananas on my oatmeal. I totally love sliced bananas in my oatmeal. My fav topping is bananas. I love raisins & brown sugar.